This entry was posted in Uncategorized on May 31, 2013 by Mila. 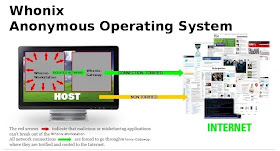 Whonix is a general purpose operating system working on virtual box, Debian GNU/Linux and Tor.Whonix is designed in a way that IP and DNS leaks are not possible, even a malware with administrative rights can not find out User's real IP adress and Location. This works by running two virtual machines,one runs TOR and acts a gateway protector and other isolated whonix workstation for complete isolation. Whonix is designed by team of TOR anonymity team,as it's under a beta version some bugs and virtuality issues may be found.. 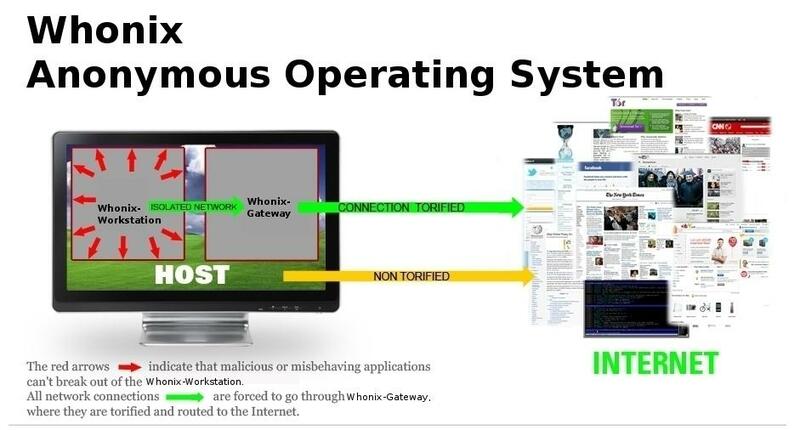 Some of the best features of whonix os are it can run flash ,java applets anonymously also it hide's the tracer from finding that you are using TOR.You can download this anonymous TOR powered whonix os from here.. 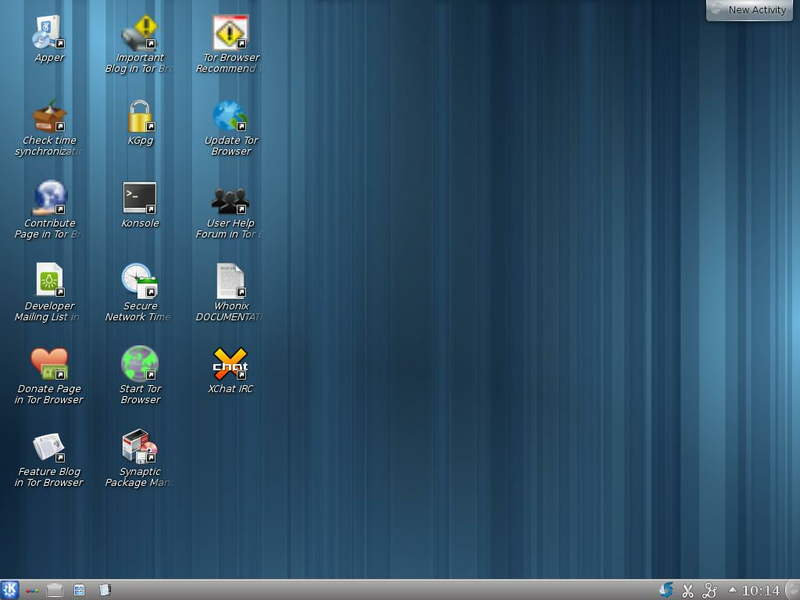 This entry was posted in os, Pentesting, security tips on May 22, 2013 by lotaya. On 18 February 2013, Mandiant released a report exposing one of China's cyber espionage units. The group, which Mandiant calls APT1, is one of the most prolific we track in terms of the sheer quantity of information it has stolen. The scale and impact of APT1′s operations compelled us to write the report and release more than 3,000 Indicators to help organizations defend against APT1's tactics. The report linked APT1 to a unit within China's People's Liberation Army and received widespread attention from the media and from the U.S. government. Three months later, Mandiant has observed a decrease in APT1's operations. However, we can confirm that APT1 continues cyber espionage operations against targeted computer networks. While Mandiant's APT1 report seems to have affected APT1 operations, APT1 is still active using a well-coordinated and well-defined attack methodology against a wide set of industries -- with a discernible post-report shift towards new tools and infrastructure. Mandiant's report and the simultaneous release of 3,000+ indicators hindered APT1's operations by causing the group to retool and change some operational methodology. Since the report, APT1 has stopped using the vast majority of the infrastructure that was disclosed with the release of the indicators. However, APT1 maintained an extensive infrastructure of computer systems around the world, and it is highly likely that APT1 still maintains access to those systems or has utilized those systems to establish new attack infrastructure in the last three months. One thing that has not changed is the activity level of many of the 20+ Advanced Persistent Threat (APT) groups of suspected Chinese origin that Mandiant tracks. These groups are still very active and Mandiant has observed no significant changes in their operations after the release of the APT1 report. These groups also conduct cyber espionage campaigns against a broad range of victims and, based on Mandiant's observations, they were not directly affected by the release of the Mandiant APT1 report. The discovery and attribution of APT1 to China's 2nd Bureau of the People's Liberation Army (PLA) General Staff Department's (GSD) 3rd Department (Military Unit Cover Designator 61398) also elevated the public dialogue about cyber espionage and the theft of intellectual property to a level not seen before. President Obama's National Security Advisor, Thomas Donilon, said that cyber espionage has moved to the "forefront" of the US agenda in its relationship with China and called for the Chinese Government to stop the hacking and to join an international process for limiting economic espionage. Congress is taking action as well. Earlier this month, Senators Levin, McCain, Coburn and Rockefeller introduced S. 884, the Deter Cyber Theft Act, which would require the Government to publish an annual report listing foreign countries that engage in economic espionage and block imports from those countries made with stolen technologies. This bill is designed to be that next step not only to "name and shame" the bad actors but also to punish them economically. The subject of Chinese attacks, such as those conducted by APT1, seems poised to stay front and center on the diplomatic agenda where, according to the New York Times, it will be a "central issue in an upcoming visit to China by President Obama's national security adviser, Thomas Donilon." This entry was posted in Advanced Persistent Threat, APT1, cyber espionage, Dan McWhorter, Indicator of Compromise, Mandiant, NYTimes on May 21, 2013 by Evan Pena. FireEye recently identified another targeted attack campaign that leveraged both the recently announced Internet Explorer zero-day, CVE-2013-1347, as well as recently patched Java exploits CVE-2013-2423 and CVE-2013-1493. This campaign appears to have affected a number of victims based on the use of the Internet Explorer zero-day as well as the amount of traffic observed at making requests to the exploit server. This attack was likely executed by an actor we have named the 'Sunshop Group'. This actor was also responsible for the 2010 compromise of the Nobel Peace Prize website that leverage a zero-day in Mozilla Firefox. The Internet Explorer (CVE-2013-1347) exploit code pulled down a “9002” RAT from another compromised site at hk[.]sz181[.]com. This payload had an MD5 of b0ef2ab86f160aa416184c09df8388fe and connected to a command and control server at dns[.]homesvr[.]tk. The java exploits were packaged as two different jar files. One jar file had a MD5 of f4bee1e845137531f18c226d118e06d7 and exploited CVE-2013-2423. The second jar file had a MD5 of 3fbb7321d8610c6e2d990bb25ce34bec and exploited CVE-2013-1493. The jar that exploited CVE-2013-2423 dropped a 9002 RAT with a MD5 of d99ed31af1e0ad6fb5bf0f116063e91f. This RAT connected to a command and control server at asp[.]homesvr[.]linkpc[.]net. The jar that exploited CVE-2013-1493 dropped a 9002 RAT with a MD5 of 42bd5e7e8f74c15873ff0f4a9ce974cd. This RAT connected to a command and control server at ssl[.]homesvr[.]tk. All of the above 9002 command and control domains resolved to 58.64.205.53. We previously discussed the extensive use of this RAT in other advanced persistent threat (APT) campaigns here. For a detailed analysis of Briba please see Seth Hardy’s paper ‘IExplore RAT’. 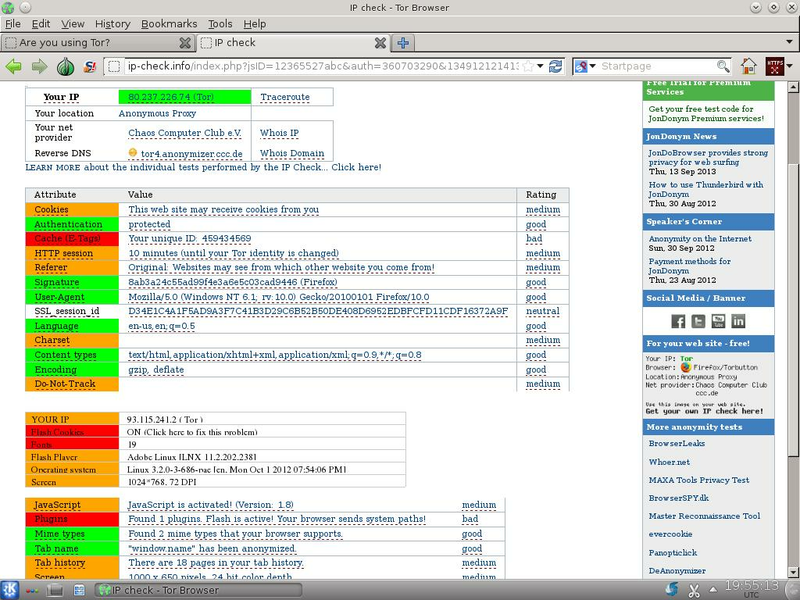 The exploit site at sunshop[.]com[. ]tw previously hosted a different malicious jar file on April 2, 2013. This jar file had a MD5 of 51aff823274e9d12b1a9a4bbbaf8ce00. It exploited CVE-2013-1493 and dropped a Poison Ivy RAT with the MD5 2B6605B89EAD179710565D1C2B614665. This Poison Ivy RAT connected to a command and control server at 9ijhh45[.]zapto[. ]org over port 443 using a password of ‘ult4life’. This domain resolved to the same 58.64.205.53 IP between April 2nd and 8th. The Sunshop Group has utilized the same tactics described above in previous targeted attack campaigns. 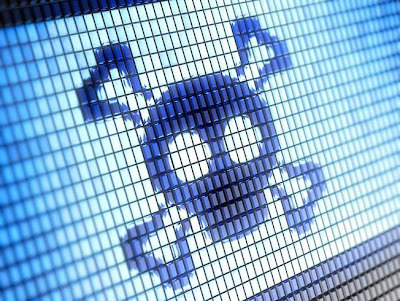 These similar tactics include the use of zero-day exploits, strategic web compromise as well as Briba malware. One of the more prominent attacks launched by this group was the compromise of the Nobel Peace Prize Committee’s website in 2010.This attack leveraged a zero-day exploit targeting a previously unknown vulnerability in Mozilla Firefox. Another publicly documented attack exploited a Flash zero-day and can be found here. Mila at the Contagio Blog posted additional information on this attack here. This attack dropped the same Briba payload discussed above. 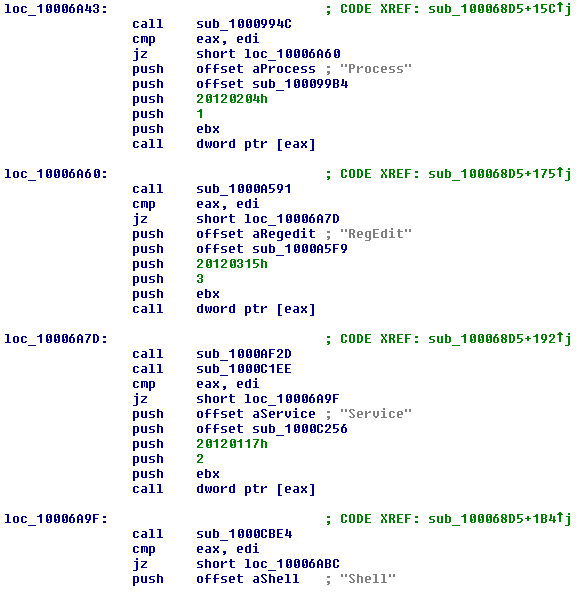 FireEye detects the Briba backdoor as Backdoor.APT.IndexASP and the 9002 payloads as Trojan.APT.9002. This entry was posted in Blog, Ned Moran, Threat Research on May 20, 2013 by Evan Pena. This entry was posted in security tips, SQL Injection, Web hack on May 16, 2013 by lotaya. 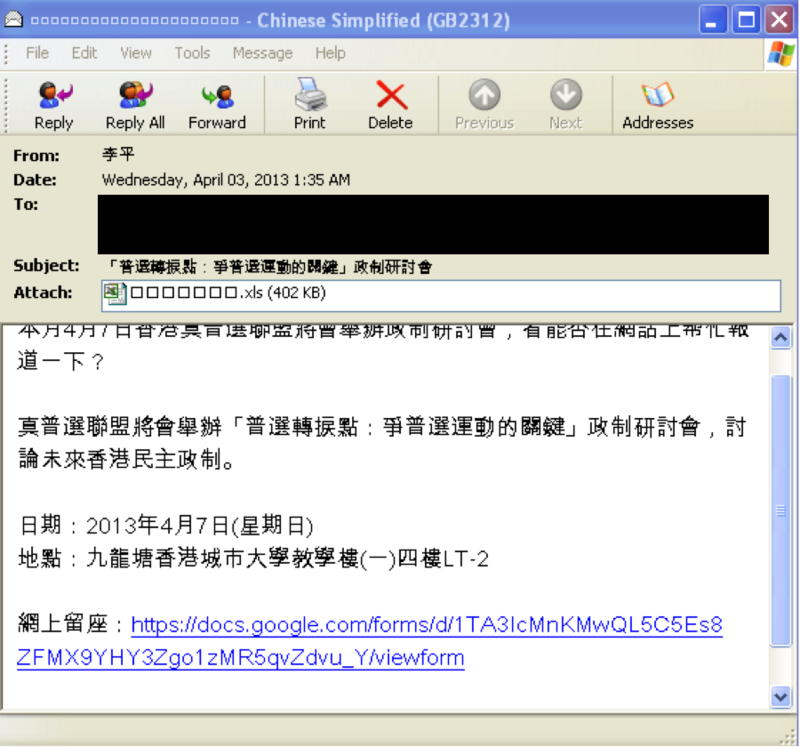 FireEye Labs has discovered a targeted attack towards Chinese political rights activists. The targets appear to be members of social groups that are involved in the political rights movement in China. The email turned up after the attention received in Beijing during the 12th National People's Congress and the 12th National Committee of the Chinese People's Political Consultative Conference, which is the election of a new core of leadership of the Chinese government, to determine the future of China's five-year development plan . The email contains a weaponized attachment that utilizes the Windows Office CVE-2012-0158 exploit to drop the benign payload components and decoy document. The Remote Access Tool (RAT) PlugX itself is known as a combination of benign files that build the malicious execution. The Microsoft file OInfoP11.exe also known as “Office Data Provider for WBEM” is a certified file found in the National Software Reference Library (NIST) and is a component from Microsoft Office 2003 suite. For integrity checking endpoint protection, this file would be deemed as a valid clean file. In Windows 7+ distributions, the svchost.exe will require user interaction by displaying a UAC prompt only if UAC is enabled. Although in Windows XP distributions, this attack does not require user interaction. The major problem is that this file is subject to DLL Sideloading. In previous cases, PlugX has been utilizing similar DLL Sideloading prone files such as a McAfee binary called mcvsmap.exe , Intel’s hkcmd.exe , and NVIDIA’s NvSmart.exe . In this case, OInfoP11.exe loads a DLL file named OInfo11.ocx (payload loader posing as an ActiveX DLL) that decompresses and decrypts the malicious payload OInfo11.ISO. 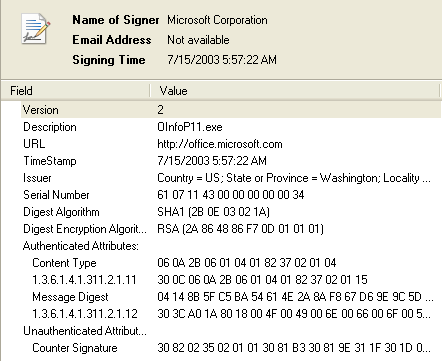 This technique can be used to evade endpoint security solution that relies on binary signing. Traditional anti-virus (AV) solutions will have a hard time to identify the encrypted and compressed payload. At the time of writing of this blog, there is only 1 out of 46 AV vendors can detect the OInfo11.ocx file. The diagram in figure 1 shows the behavior and relationship of these files. 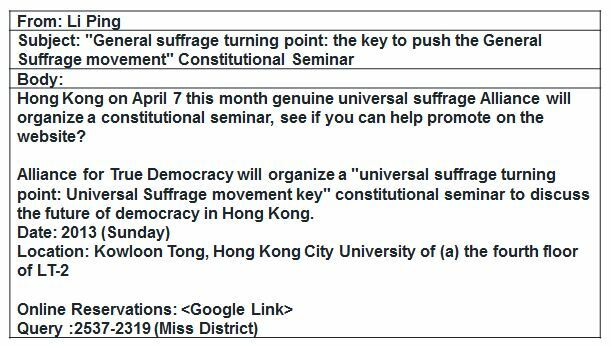 In Figure 2, the targeted email advertises a suffrage movement seminar event. Figure 3 is the contents of the Google document form link that contains the same information as in the email. 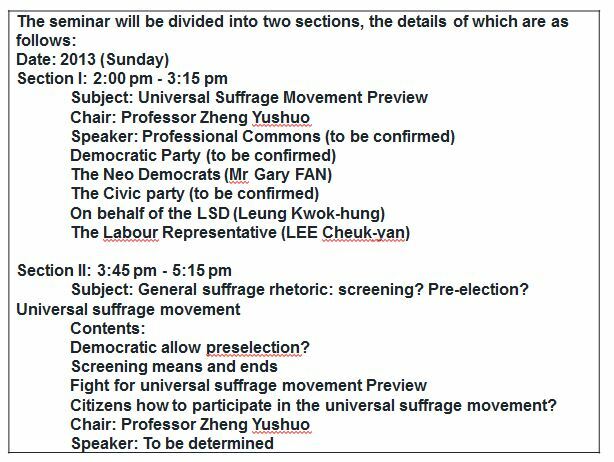 In figure 4, the decoy document contains the details of the particular seminar section mentioned in the Google document link. 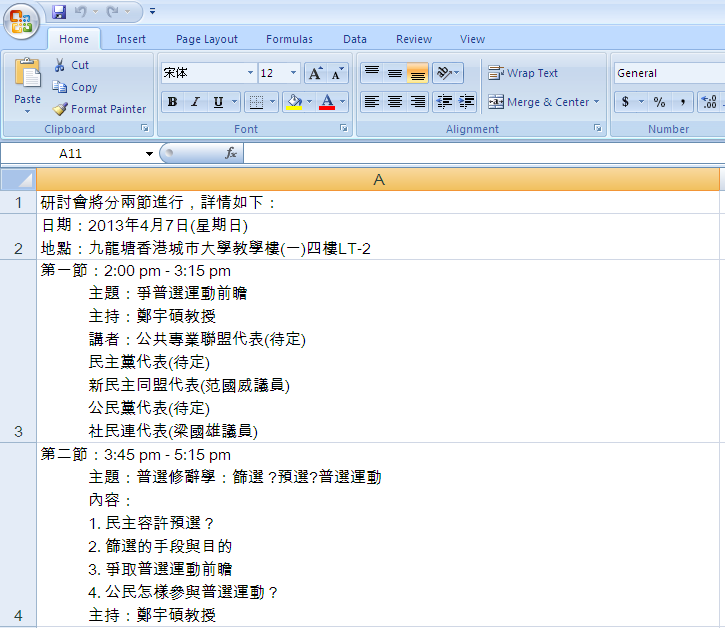 Below is the English translation of the email in figure 2. Below is the translation to the document shown above. The XLS file (1146fdd6b579ac7144ff575d4d4fa28d) utilizes the CVE-2012-1058 Windows Office exploit to drop the “ews.exe” payload and the decoy document shown in figure 4. This payload extracts the Microsoft file OINFOP11.exe, the benign DLL OInfo11.ocx and encoded and compressed shellcode sections from Oinfo11.ISO. OInfoP11.exe will load OInfo11.ocx as a DLL and once loaded will decompress using RTLDecompressBuffer and decrypt the Oinfo11.ISO to run in memory. The malicious execution is never dropped to the file-system and is therefore not seen by filesystem-based anti-virus detectors. Figure 5 shows the high level view of the relationship of the dropped files. 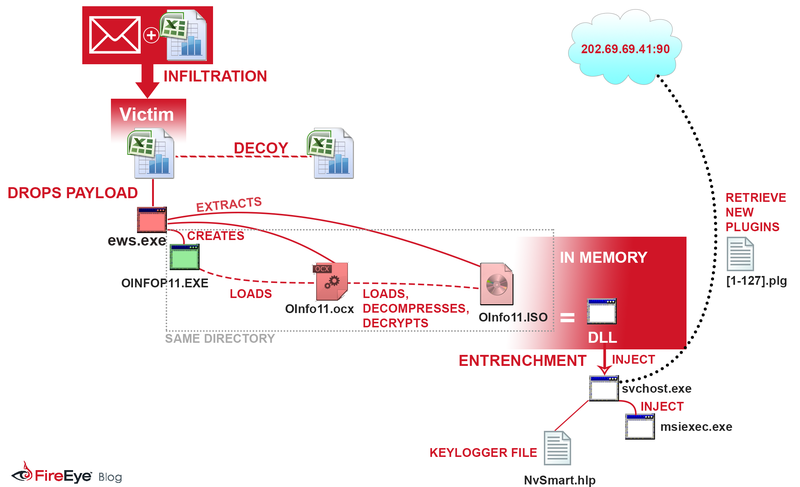 This malware uses CVE-2012-0158 to drop the payload from the section shown in Figure 6. 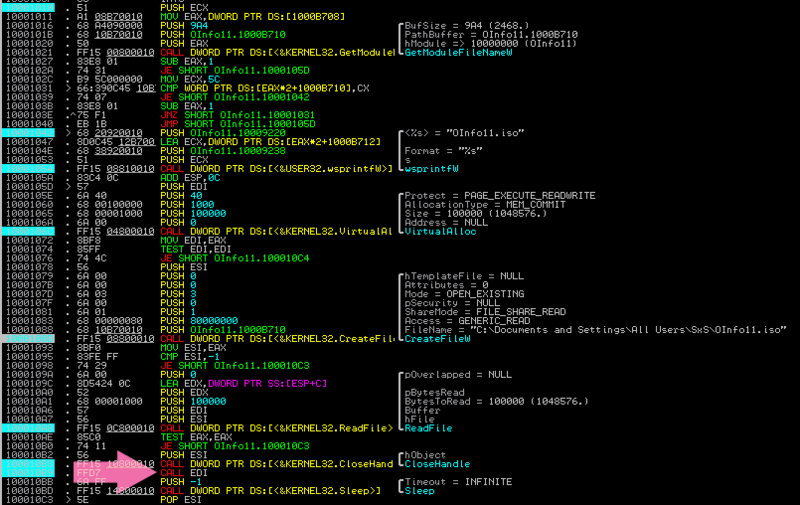 Shellcode can be found in the first few bytes of this section. 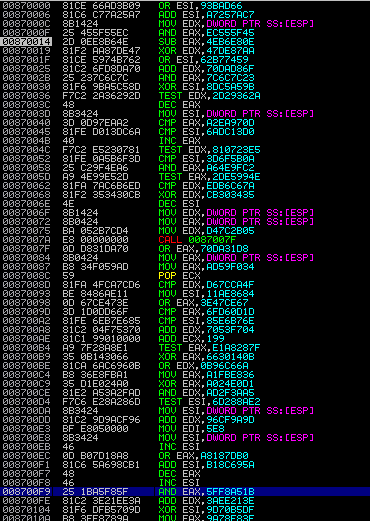 Figure 7 shows the disassembly of the code found at the 0x1de0b offset shown in figure 6. OInfoP11.exe is a valid Microsoft file and its certificate is shown in figure 8. When the OInfop11.exe is called with the following arguments as C:\Documents and Settings\All Users\SxS\OINFOP11.EXE" 200 0, it will begin the loading of the file OInfo11.ocx. The arrow shows the exact jump point where the entrypoint to where the shellcode begins for the decompression and decryption of the ISO file. This is an example of the memory space of the loaded benign DLL OInfo11.ocx. The functionality of OInfo11.ocx is essentially a loader in which this section decompresses and decrypts the malicious payload in memory. 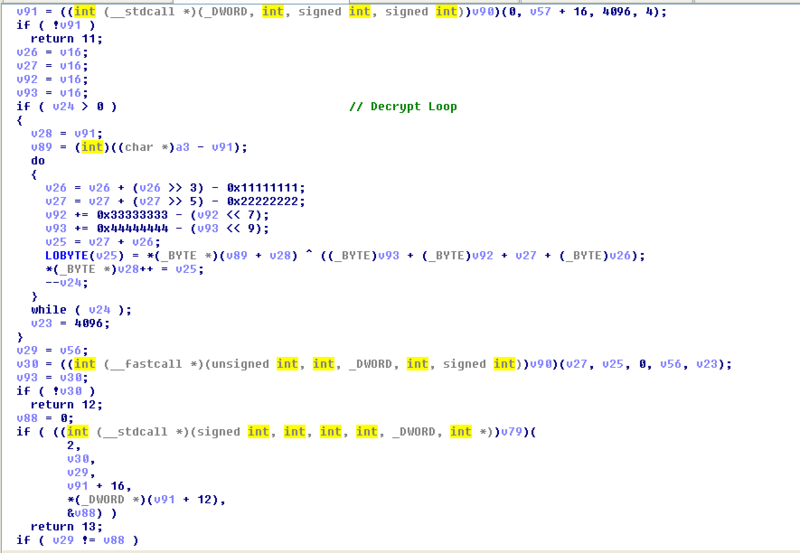 This is the decryption loop used through out the sample. 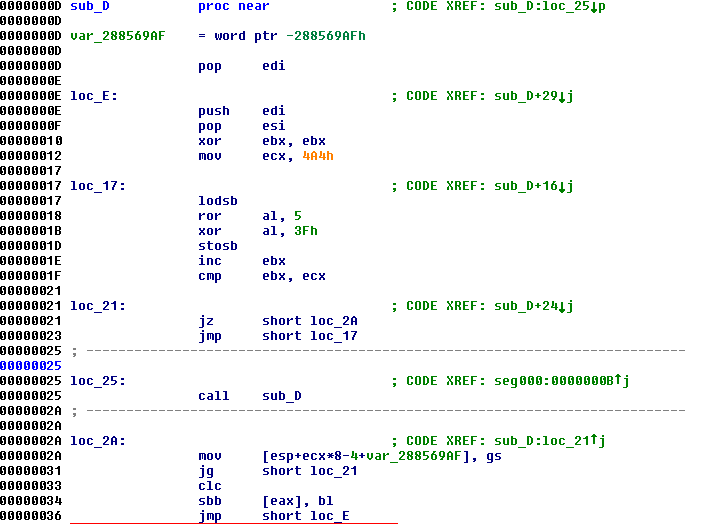 In this instance, it is used to decrypt the ISO shellcode in memory. 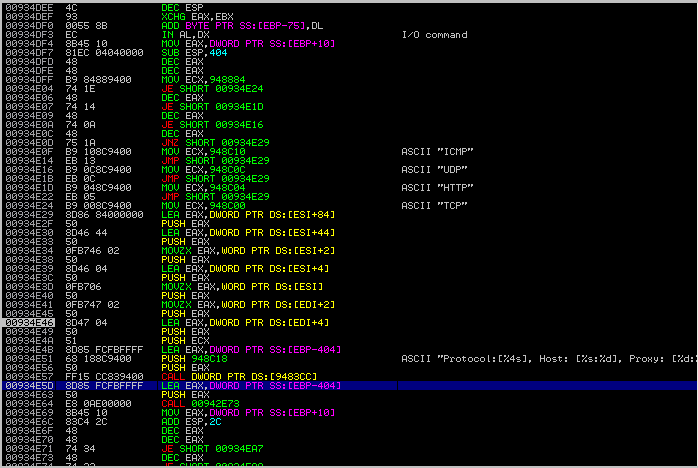 This is an example of the complete malicious DLL address space in memory. The DLL injects code into svchost using the VirtualAllocEx call then uses WriteProcessMemory to write into the memory space of svchost.exe. The thread is then resumed to run the injected code. This injection process is used for both svchost.exe and msiexec.exe. When svchost.exe spawns msiexec.exe it calls the CreateEnvironmentBlock and the CreateProcessesUser so that the svchost service can launch a user session. Creates a kellogging file in %ALLUSERS PROFILE%\SXS\ as NvSmart.hlp. Below is an example of the content of this file. This sample can communicate using ICMP, UDP, HTTP and TCP. In this situation the sample is using the string Protocol:[ TCP], Host: [202.69.69.41:90], Proxy: [0::0::] to establish the proxy for the C&C communication. Modes of Operation Overview The table below outlines some of the functionality that this variant uses. The options have not changed so therefore this table is used as a refresher. Figure 15 shows an example of how these functions are called by the sample. In figure 16, the sample is communicating to 202.69.69.41 over port 90. The C&C node is down in this case, but the communication is dynamic non-http communication. An example of the callback content is shown in figure 17. This sample will also try to communicate with other instances laterally in the same network. An example of this traffic and content can be seen in figure 18 and figure 19. I want to thank the FireEye Labs Team. This entry was posted in Amanda Stewart, Blog, Threat Research on May 14, 2013 by Evan Pena. Last week I was contacted by an agent of Mobily, one of two telecoms operating in Saudi Arabia, about a surveillance project that they’re working on in that country. Having published two reasonably popular MITM tools, it’s not uncommon for me to get emails requesting that I help people with their interception projects. I typically don’t respond, but this one (an email titled “Solution for monitoring encrypted data on telecom”) caught my eye. This entry was posted in Uncategorized on May 13, 2013 by Moxie Marlinspike. I will begin as previously instructed using the UNION method to show that this method doesn’t always work (despite being the easiest). This will keep you from wasting your time as this is not the method to be starting with, due to time involved. OK so we test our site link to see if the page is vulnerable by adding the single quote to the end of our page link, and check the response for errors. If we get the page to refresh without any errors it is an indication that the table actually exists, whereas if the table does not exist the server will generate an error of some kind. We will use this info to map things out and simply keep replacing the table referenced after the FROM part of the statement until you are satisfied you have found all of the ones you’re interested in. In our example above we have found the table “admin” as the page refreshed 100% indicating the table name is present whereas errors were received on all of the others. NOTE: In the errors sometimes it will say “Table 'X.<guessed-table-name>' doesn't exist”. This error indicates the current database name where “X” is (in case you couldn’t find it elsewhere). TIP: When guessing table names, start with the obvious ones and then work to more general ones. Also if you know you only care about specific ones then only work on those ones (admin, users, members, admincp, etc). Also be aware that not all admins are 100% dummies so they may have done something super tricky like rename them. I find a lot like to use site-name as prefix, or site-prefix-db and then the table or database names (i.e. Microsoft.com might use this type of naming convention m_admin, m_users, m_members, or maybe mdb_admin, mdb_users, etc). If you have time make sure you try all options as once you find one the rest typically follow the same naming convention. 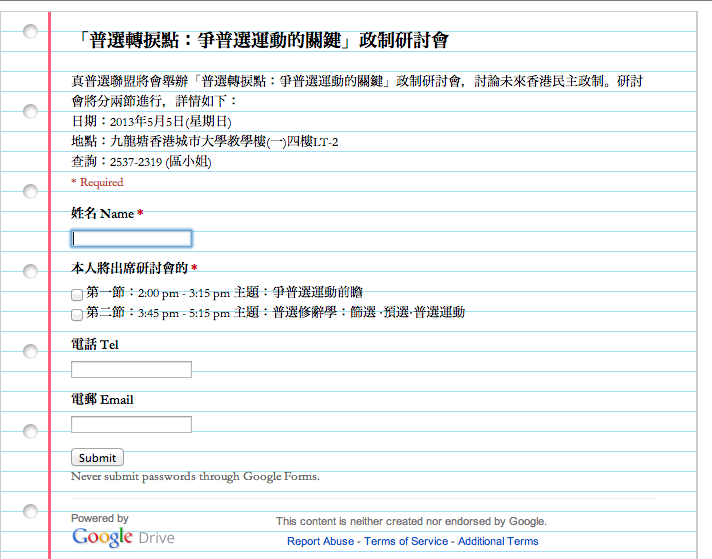 It looks like we have found the columns “userid”, “username” and “password” from our “admin” table. o FALSE – indicating we have gone too far – WTF? OK so we have no found the first two letters of the password which are “pa”, let’s keep guessing…. o FALSE – indicating we have gone too far and that we were right on track with the guessing of an “s” which is the char value for 115…wonder what’s next? When we put it together we have found char values of 112, 97, 115, & 115 which when converted equates to “pass”. The admin with userid=1 has a password of “pass”. 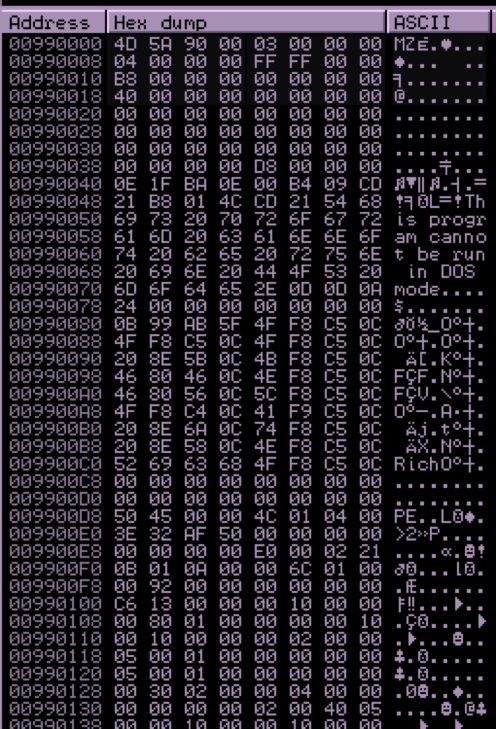 In some cases the char values may be for an MD5 hash so it might not come across until you have the entire thing. You can keep adjusting the LIMIT value until you no longer get any return values (i.e. ERRORS) indicating there are no more character positions to enumerate. NOTE: To help speed things up we can use the start and end point for the ASCII chart which starts “A” at 65 and has “z” at 122. You can then use the results to narrow down your search to more appropriate section or letter. I tend to focus on the lower case options first (97-122) to speed things up, but the full chart can come into play in the wild. I will be working to add a page or post with a full ASCII conversion chart but is a pain to put it into HTML table format so it will format correctly on this blog (I already tried several times to take an easier route, but will have this up in a few weeks’ time so please check back. This brings my tutorial on BLIND SQL Injection to an end as we have now covered things from find to extraction. 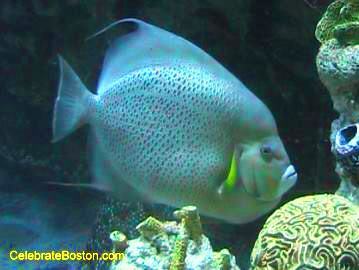 I hope you have been able to follow along and find the information helpful. Please remember to check my other pages for more tutorials on other methods or tools. I have also included some extras below for additional reference. Until next time…Enjoy! RESULTS = 53, 46, 48, which converts to “5.0”. You would simply keep increasing the LIMIT to move forward character positions until you hit the end and error out. You usually don’t have to check the “-“ or “+” signs until further down the version description (i.e. 5.0.1+log or 5.3.7-community) but thought I would show you how to test for them in the examples. The syntax will change, but the overall method is similar to the previous examples however we will be using time to determine TRUE/FALSE results (if vulnerable the time delays will be noticed before the page refreshes). You may need to adjust the time settings to fit your need but these will get you started. This will get the first table name of the current database. That concludes my coverage of TIME-BASED BLIND INJECTIONS. I can’t show the photos so hopefully it makes sense. Try adjusting the times until you find something that works. A great method to learn this is to wait until you have found a site you can get with a tool (like SQLMAP) that confirms the method used was time based. Then you can manually test afterwards to see how things work. Really hope you appreciate this one as this took the longest to organize and make sense of. If you have any other methods that I missed than can be easily documented please let me know so I can update this write up. Until next time…Enjoy! This entry was posted in SQL Injection, Web hack on May 8, 2013 by lotaya. This exploit dynamically creates a .jar file via the Msf:: Exploit::Java mixin, then signs the it. The resulting signed applet is presented to the victim via a web page with an applet tag. The victim’s JVM will pop a dialog asking if they trust the signed applet. On older versions the dialog will display the value of CERTCN in the “Publisher” line. Newer JVMs display “UNKNOWN” when the signature is not trusted (i.e., it’s not signed by a trusted CA). 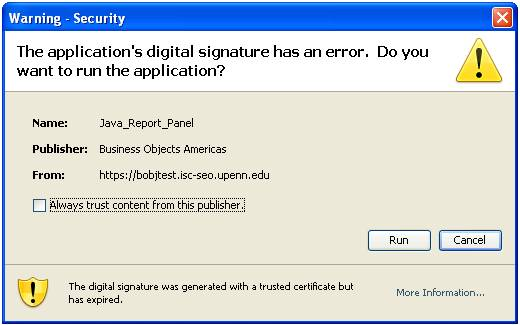 The SigningCert option allows you to provide a trusted code signing cert, the values in which will override CERTCN. If SigningCert is not given, a randomly generated self-signed cert will be used. Either way, once the user clicks “run”, the applet executes with full user permissions. This entry was posted in Backtrack, Exploits on May 6, 2013 by lotaya.